In order to avoid causing a nuisance to other road users, this system corrects the height of the xenon headlamp beams automatically and when stationary, in relation to the load in the vehicle. If a malfunction occurs, this warning lamp is displayed on the instrument panel, accompanied by an audible signal and a message in the screen. 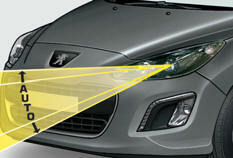 The system then places your headlamps in the lowest position. Do not touch the xenon headlamp bulbs.